In a world-first study published today, researchers say dredging activity near coral reefs can increase the frequency of diseases affecting corals. “At dredging sites, we found more than twice as much coral disease than at our control sites,” says the lead author of the study, Joe Pollock, a PhD candidate from the ARC Centre of Excellence for Coral Reef Studies (Coral CoE) at James Cook University (JCU) and the Australian Institute of Marine Science (AIMS). In the past 20 years, the frequency of coral disease has risen across the world, and has become a significant factor in global coral reef decline. 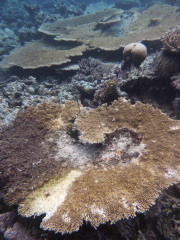 In the Caribbean, disease has diminished coral cover by as much as 95 percent in some locations. This is the first study to examine the link between dredging and coral disease in nature. It was conducted near Barrow Island, off the West Australian coast. The site is close to where an 18-month, 7-million cubic metre dredging project took place, developing a channel to accommodate ships transporting liquefied gas to a nearby processing plant. The site was in otherwise very good condition. “Turbidity and sedimentation are critical pressures on the health of coral reefs and are affected by many human activities, especially in the coastal zone,” Schaffelke says. Coastal industries provide economic stability, food security and reliable energy to billions of people around the world. As the pace of coastal development and demand for larger harbours escalates, the impact of elevated sediment and turbidity on the health of marine species is now a worldwide concern. “Dredging is a pressing issue on many coral reefs throughout the world, including the Great Barrier Reef,” says Pollock. 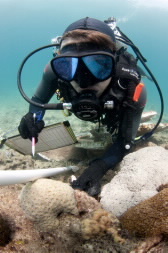 “A solid understanding of the impacts of dredging, sediment and turbidity on coral health will be indispensable in the development of well-informed management and monitoring strategies for vulnerable coral reef ecosystems,” he concludes. 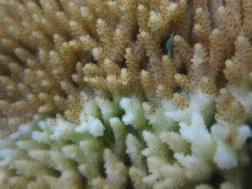 Corals with white syndrome. Credit: F. Joseph Pollock. Joe during field survey. Credit: Ed Roberts.